Early Morning Run: Where is the Sun? It is snowing again. I don't think we've had this many snow storms in one winter since I moved here almost six years ago! I don't really mind snow, but the fact that this storm has also included rain and sleet and is being called a 'snow hurricane' by meteorologists, plus the fact that the MORE/Fitness Half Marathon is two months from today and I need to get some outdoor running in, makes me ready for this winter to be over! To counteract the snow and gloom, I am so excited to say that Katie, over at Health for the Whole Self, passed on to me my first 'bloggy award' - the Sunshine Award! 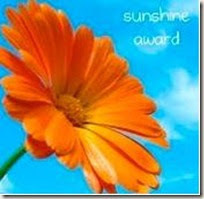 According to Katie, “The Sunshine Award is awarded to bloggers whose positivity and creativity inspire others in the blog world.” I am extremely honored that Katie not only reads my blog, but that she is inspired by it! I'm so glad that I found Katie's blog a few weeks ago. She is intelligent, funny, caring and I feel our ideas and views are very similar. Her blog is a 'must read' on my list! 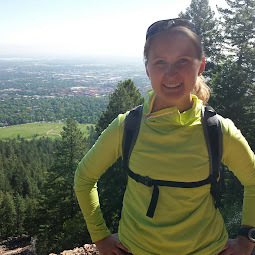 I have to say, that I've been inspired by so many other bloggers and non-blogging runners and health enthusiasts over the past few years and have learned so much from so many people. As much as I appreciate being recognized, I feel that because so many others inspire me, I can't begin to name you all. Instead, I'm going to name one blogger, who is first and foremost a friend. She has been through more in the past few years than anyone should have to deal with in an entire lifetime. Her humor, sincerity, willingness to share her raw emotions and her beautiful writing inspire me to keep moving every day. Heather, at The Spohrs are Multiplying, has touched so many lives and I can confidently say that she has inspired thousands more than just me. In other news, I'm very excited about something new I'm getting involved with! Well, the organization isn't new, but it's new for me. Last night I met with a woman from Girls on The Run to talk about how I can get involved. We had a great chat, discussing the organization, running, and an assortment of other things. I'm very excited about working with the organization, volunteering with the Communications committee, meeting likeminded women in NYC, and helping to expose young girls (ages 8-12) to running and self-esteem boosting opportunities! I'm sure I'll talk much more about this in the months to come! Before I go for today, I can't ignore another win by the USA Men's Hockey team at the winter olympics!! Ryan Miller (an MSU alumni!) saved 19 goals in yesterday's game after stopping 42 on Sunday! He's on a roll and is still going strong! The women's team is playing against Canada in the gold medal game today and the men's team plays again tomorrow. GO USA!! We certainly could use some sunshine on a nasty NYC day like today. PS I'd love to learn more about Girls on the Run. I'll check out their site but keep me posted about getting involved. I was happy about the hockey win too, looking forward to ladies ice skating tonight! congrats on your award! I'm going to check out the sites you listed. That is so awesome that you're getting involved with Girls on the Run! I just recently heard about the organization, and it sounds like it does really great work. There's a chapter in my area, so I might look into getting involved as well! I LOVE LOVE that you are getting involved and cant wait to hear more. I think that would be a great organization to Volunteer for. Honestly I have not watched the Olympics much, too much going on.. I am watching it snow as I type. This is as bad as I can remember, and I have been here 17 years. One storm after another, and cold in between. But soon it will be spring and we can start looking forward to great sunny runs in the Park. That is what is so great about living and running here. And the hockey was nail biting. I expect another tough game against FInland. I love the idea behind girls on the run and plan on getting with them at the expo this weekend to coordinate being a part of the Orlando unit! Ugh, I am SO over this snow!! Spring needs to come soon! Very cool that you're getting involved with Girls on the Run! That sounds like a great organization.